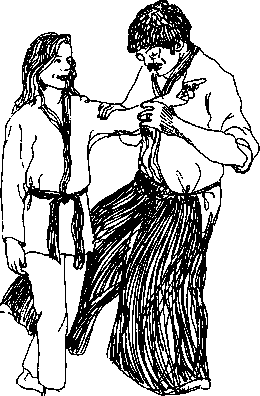 The techniques introduced thus far are the derivatives of such basic exercises as Katate-dori, Kata-dori and Shomen-uchi. However, Katate-dori, Shomen-uchi, Tsuki and Muna-dori are interrelated. 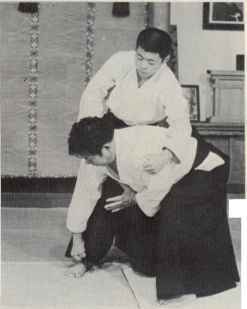 Consequently, it is possible to study Katate-dori techniques from entirely different angles. feet, turn your hips, swinging up the sword and cutting to the rear. Rotate your body 7/8 of a circle rightward and cut down.